The English test summer has been a summer of thrashings. Not only the one-sided day-night affair at Edgbaston last week, but also the South Africa series finished without producing a single game which you would really call close. This is not something terribly unusual. Large margins of victory are the norm in test match cricket, even if the two teams competing are fairly evenly matched, as has been noted previously on this blog. 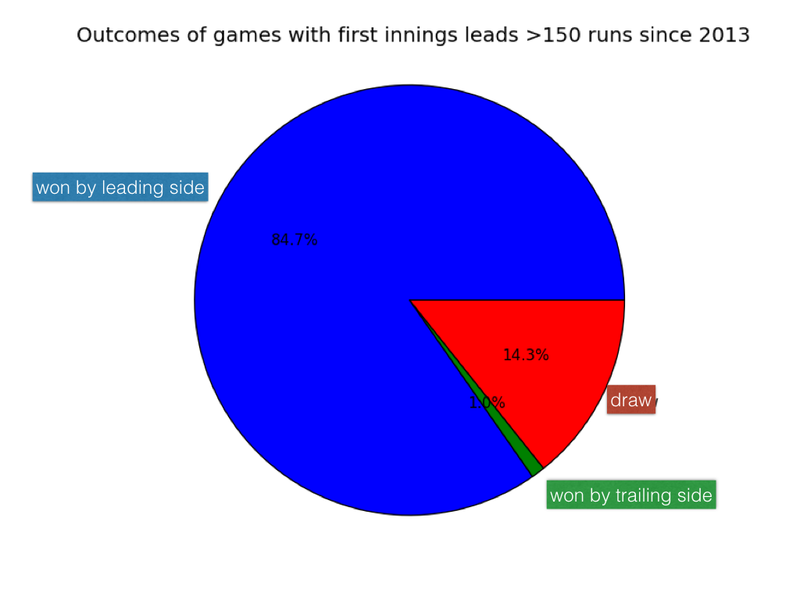 There has been another common feature of these games- related to, but separate from, the comfortable victory margins: the outcome was highly predictable once both teams had batted once. The first innings leads in England's home games of 2017 have been: 97, 130, 178, 136 and a whopping 346. With these leads duly established, the side ahead has remained more-or-less in control for the remainder of the game. 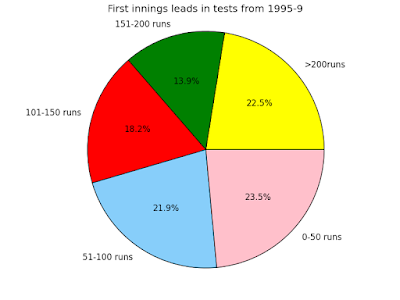 This observation prompts today's blog topic: how frequently are modern test matches virtually decided by the time both teams have batted once? 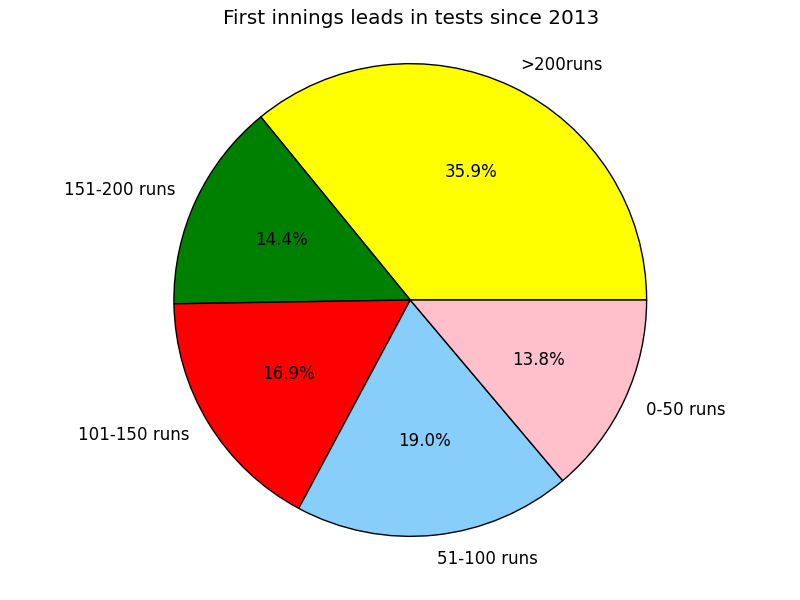 So around half of modern test matches really are basically over once each team has batted once- perhaps taking you up to the early to mid stages of day 3 with any real doubt about the destination of the game. You may wonder whether the qualifier "modern" was really necessary in that last sentence. Perhaps it was ever thus. People often like to tell you that the past was better, but people are often wrong. I haven't attempted an analysis of first lead innings over the entire history of test cricket, which is what I would have liked to do. Unfortunately, I wasn't clever enough to find a time-efficient way of gathering the data on first innings leads (statsguru doesn't have a button for that). But to provide a bit of historical context for the data above, I homed in on the data for a 5 year period in the late 90s, by way of comparison with the modern day. I chose this period for no better reason than that it was the time I first got into cricket and I feel nostalgic about it. The data from 1995-1999 support the theory that tests were not quite so frequently decided early in those days, as you can see below. Only around a third of games saw first innings leads above 150 runs, and nearly a quarter were within 50 runs on first innings (as an aside, games with sub 50 run leads are basically toss-ups, both in the 90s and now- dividing roughly evenly between the leading side, the trailing side and the draw). In games which did feature a big difference on first innings the distribution of outcomes were basically the same as they are now- so teams weren't necessarily better at responding to a large deficit, but large deficits weren't quite so frequent. Test cricket is a wonderful sport, but I think it must be admitted that one of its weaknesses is that it very easily produces one-sided games which are over long before they are over. This has probably always been the case to some extent, but it would appear to have become exacerbated of late. Proposed explanations and solutions for this may vary. When a truly nail-biting test match comes along, uncertain to the end, treasure it for the previous jewel it is.